Homeless people all over are a big problem in the world including the USA. 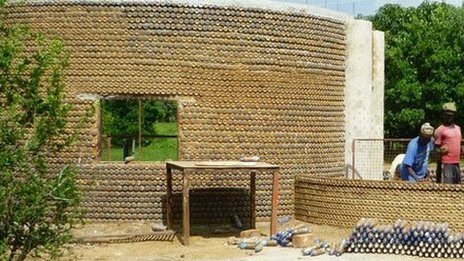 Amnesty International has made houses of used plastic bottles filled with sand. The houses can be completed by cement or simply the soil. Walls of these houses are bullet and additionally fire proof. They can easily withstand the temperature of 64 degree celsius. These livable houses are of low cost when compared to brick and stones. One litter bottles need to be used to make two bedroom house measuring 1200 square feet. Thus, making 9250 houses per day will solve the housing problem of the US. 3.4 million homes can be readied in a year to solve the housing problem of the US. America could end homelessness in one year by doing this. The construction of plastic bottle was commenced in India, South and Central Africa. The “bottle brick” technology started nine years ago, providing a cost-effective, environmentally-friendly alternative to conventional buildings by bricks. There are fears if the fever catches on, the sand prices will shoot up and push the cost up. However, the environmental problem of plastic littering in the third world and plastic land fill in the west will be a thing of past. Many people in third world countries have taken up building cheaper but sturdier homes out of plastic bottles, from Africa to Asia. Perhaps the trend will catch on in America and all of those bottles will stop ending up in the landfills. Here below you have You tube link for watching the bottle house.